When tax issues cannot be settled out of court, tax litigation may be unavoidable, and having an experienced, aggressive litigator on your side can be crucial to the outcome of your case. Denver Tax Litigation Attorney Scott Goldman has a proven record of success when it comes to fighting for his clients’ rights in various types of tax litigation proceedings. 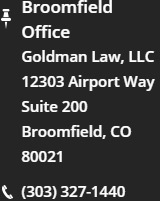 At Goldman Law, LLC, our Denver tax litigation attorney is a seasoned litigator who is effective at fighting for his clients’ rights and helping them obtain favorable resolutions to their cases. Denver Tax Litigation Attorney Scott Goldman is an experienced tax advocate who is ready to defend you and your interests in state courts, U.S. District Court, appeals courts and the U.S. Tax Court. He is also skilled at overseeing various administrative proceedings in state and federal agencies. Other civil and criminal tax matters. Not backing down until our clients are able to obtain positive results for their cases. The bottom line is that tax issues don’t go away – they generally get worse the longer they aren’t dealt with. The sooner you take action by hiring an experienced attorney like Scott Goldman, the less costly and drawn out any future tax litigation proceedings will likely be. If you are facing impending tax litigation for any personal or business-related tax issue, don’t try to resolve this matter on your own. 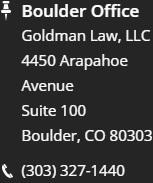 Instead, contact the trusted Denver tax law attorney at Goldman Law, LLC. He is ready to defend your rights and help you resolve your tax issues as favorably as possible. At Goldman Law, LLC, we have the experience, resources and dedication necessary to helping our clients resolve their tax issues as beneficially and efficiently as possible.